If you’re asking this, you’re correct. But you know what I realized? I never gave you the full tour of Flip 3 with before and afters! I did a room by room tour, however. Flip 3 was a midcentury rancher. It was my sweet Grandma & Grandpa’s house, so it had a very emotional pull to it. But I still tried to keep a business mind when tackling this project. Very little had been updated throughout the years, so I had my work cut out for me! The exterior was so, so bland. I needed it to be a cutie charmer from the road! 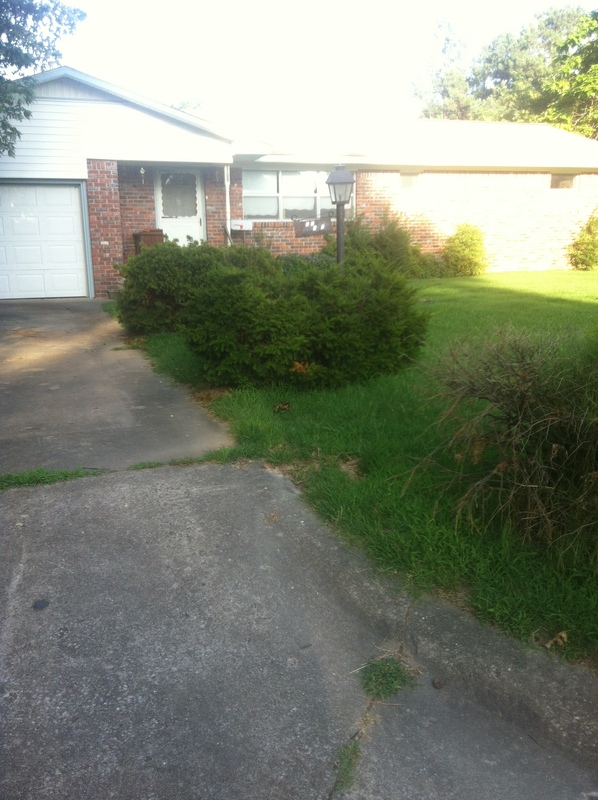 By removing some overgrown, half-dead shrubs, Uncle Nuny building the DIY lamp post, painting the exterior brick, and giving the front door a cheery paint color, the adorable home had curb appeal. How different does it look from the outside? Isn’t it adorable now? Not a lot happened, but, yet, a lot happened! One of the most dramatic changes was actually one of the cheapest things I did! The view walking into the living room was a big wall. A wall with no purpose! 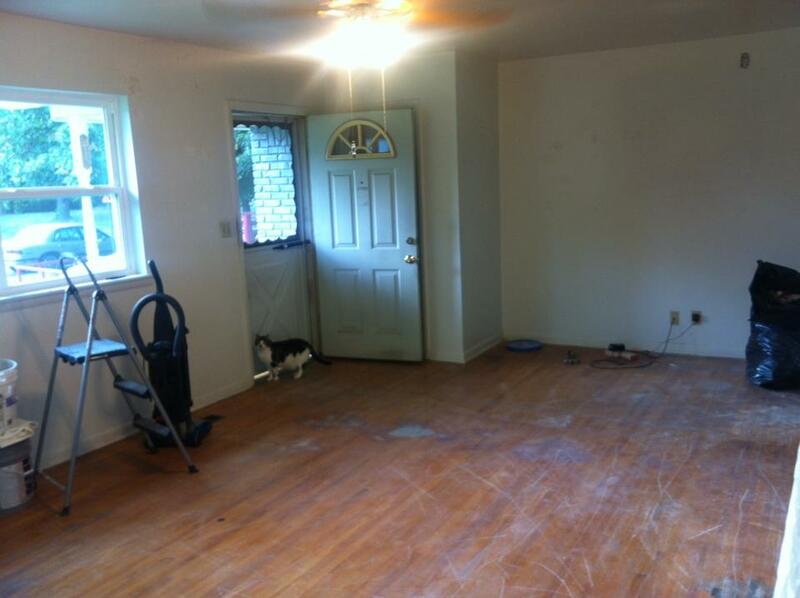 Luckily, it was not a load bearing wall, so having it removed and new trim added was only $600! Worth every penny! Instead of looking at a wall, the living room is now enormous! Or at least feels that way! Removing that wall was a game changer for the layout of this house, and what a huge impact it had! 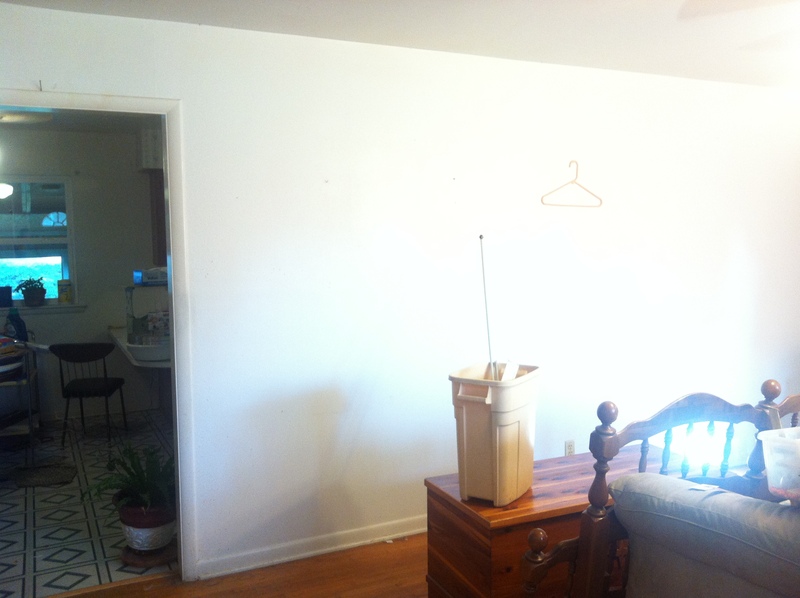 Refinishing the original wood floors also brought me a lot of bang for my buck! Similar to the exterior, the living room was very blah. In all the years Mac lived here, the walls were never painted. I wanted to get some color on the walls and add some pops of cheery color to brighten up the space. 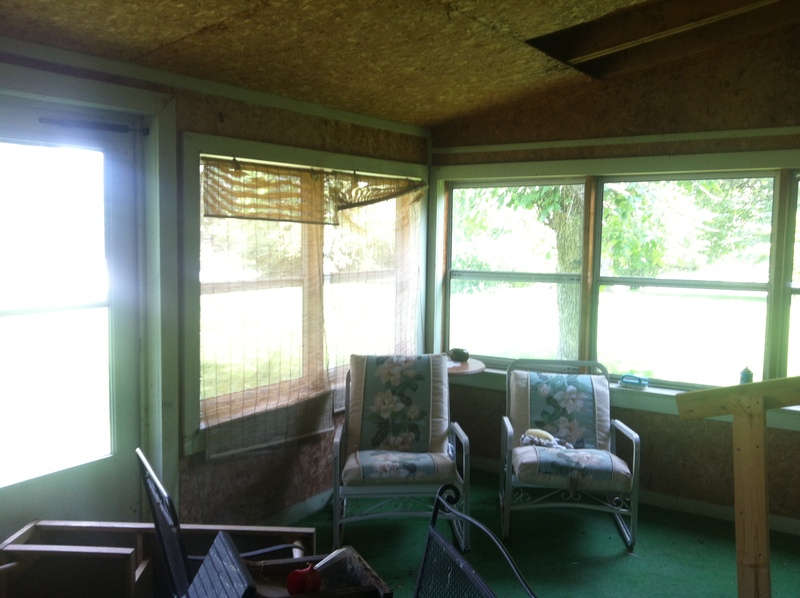 I also ditched the old windows and replaced with new, energy efficient ones! The living room transformed into a cozy room– even given its somewhat awkward layout. Removing the wall tremendously helped, as did the painted walls! I specifically chose to stage the living room with heavy nods to the midcentury era. 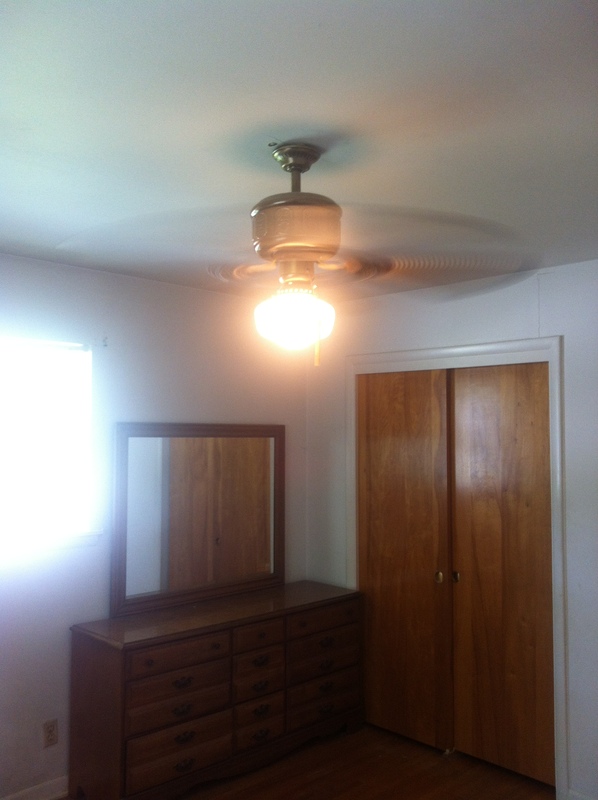 I wanted to modernize the space, but I didn’t want to lose the original integrity. And the best part? Almost 95% of everything was thrifted, so I was able to save a lot of money! But if I had to pick the greatest transformation in this house, it’s the kitchen. It was a dramatic change! I thought the original cabinet layout was not conducive to modern buyers and living and really ate up the square footage of the kitchen. 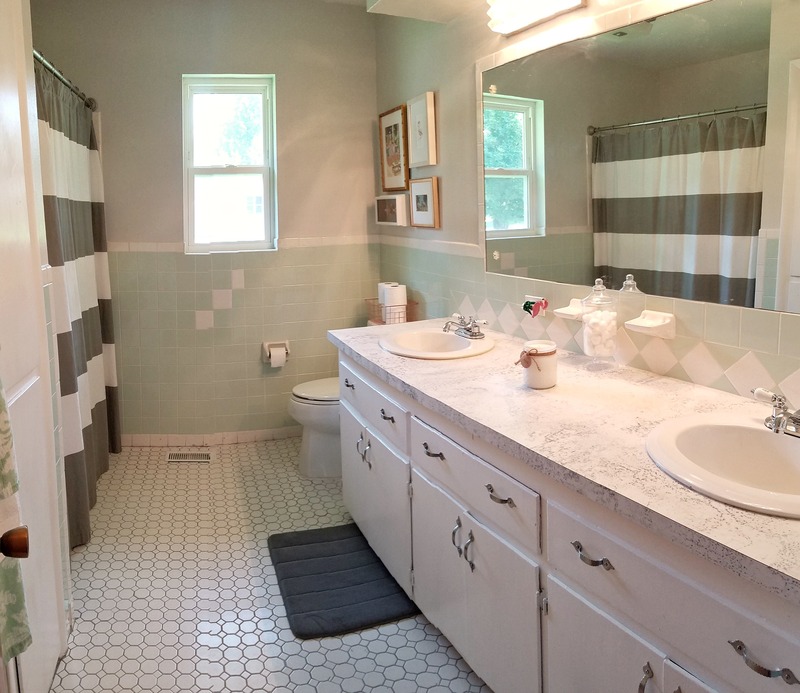 The outdated appliances and dark room was on the top of the list to address! I don’t know if I even envisioned the kitchen transformation to be this dramatic and astonishing. So many big and little projects happened in this space, and all those projects really paid off! Again, I wanted to keep the old school charm & adding that vintage metal cafeteria cabinet as an island really helped! 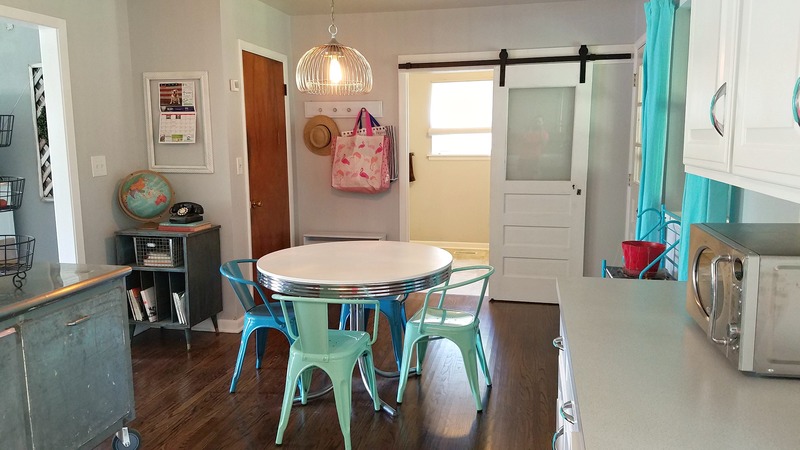 The house didn’t have a formal dining room, so the eat-in kitchen needed to really pop. The space wasn’t large, but given the right decor, I knew I could really make it stand out! And boy the little, cozy space turned out so cute! Bringing in some midcentury decor and lighting and not to mention that amazing barn door brought a lot of charm to the space! 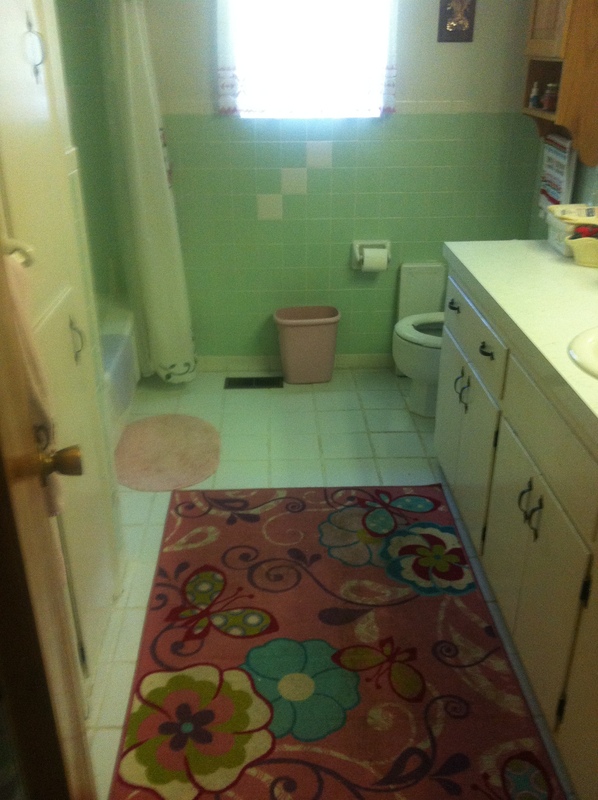 The half bathroom is also the laundry room. The space needed so much work. SO.MUCH.WORK. You think not much can change in a bedroom, right? Paint, add a new fixture and bam, it’s done. No big change. But oh my can a room transform! 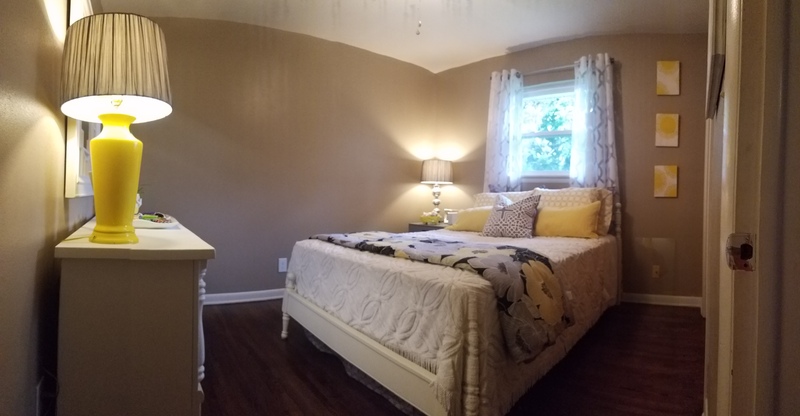 Good staging, new paint, redone floors and it doesn’t even look the same, right? I love how this room came out. Honestly, I think the staging is what set this room apart! 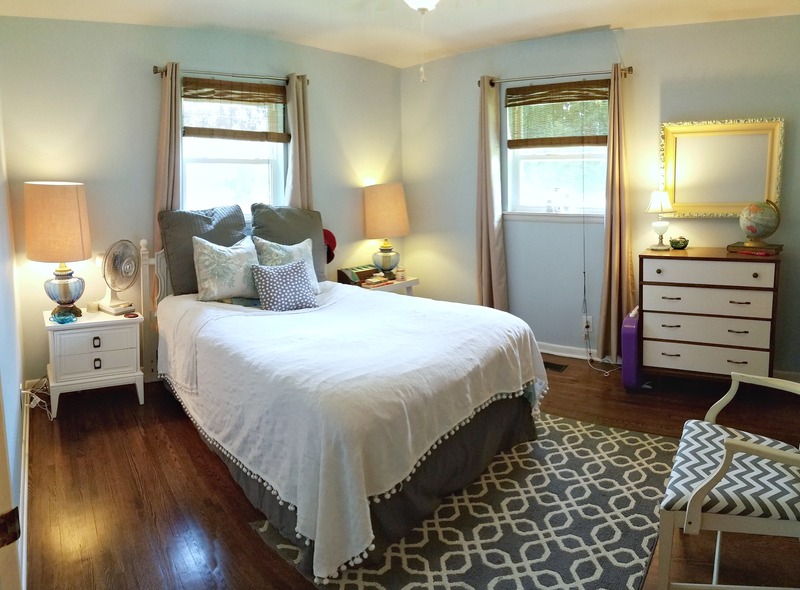 Although small, the master bedroom was a cute little space. You certainly couldn’t tell before, but it had potential! Bright. Cheery. Restful. Those were my goals for this room transformation. 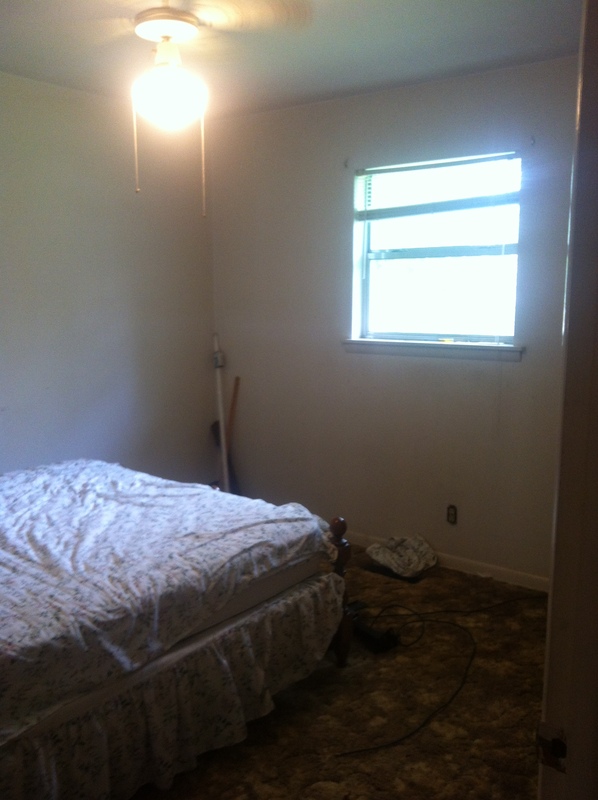 For the life of me, I have no idea why I don’t have a before picture of the third bedroom. I always stage a room as an office because, duh. Doesn’t everyone need a place to work that isn’t the couch? The only full bathroom in the house had seen better days. And it lacked the function modern buyers needed. But that mint green tile? GOLD! A single sink is now a double sink. Cracked tiles are now midcentury hexagon mosaics. White walls are now gray. Awful lighting is now reclaimed midcentury fictures. Faded countertops are now refreshed. And it didn’t lose a bit of its character even with all of those changes! 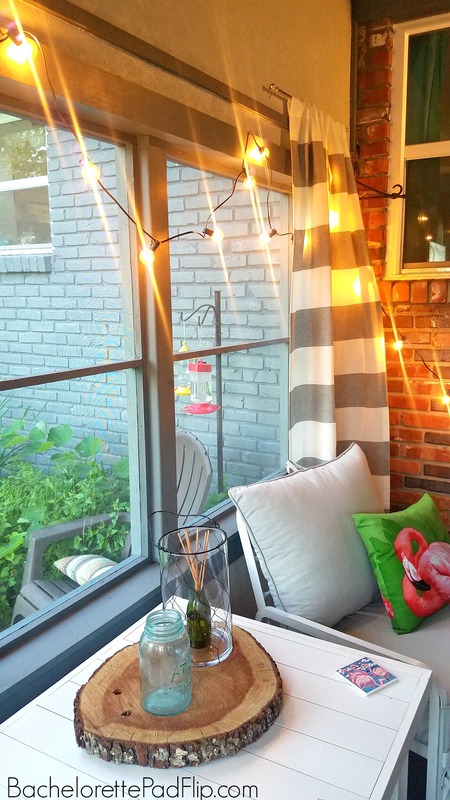 And the last big project was the sunroom. It was in awful, awful condition. On a very tight budget, I knew I had my work cut out for me. But I did it! 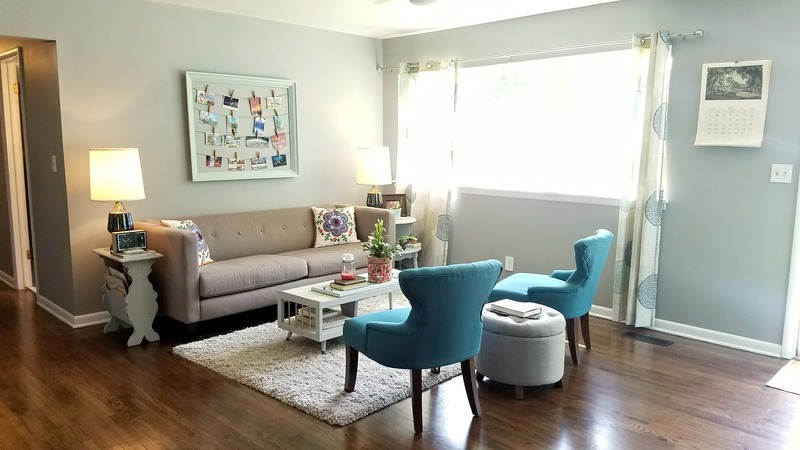 With a hell of a lot of paint, ingenuity and very minimal money, this space now beckons you to sit down, relax, and unwind! So much work went into this home. It started out as a true fixer upper. It needed a lot of attention and a lot of love. But boy was this one fun! I discovered the sweet spot of midcentury homes. There’s a high demand for non-cookie cutters like these. It was fun and emotional to work on a family home, but I LOVED how it turned out! What’s your favorite room transformation? 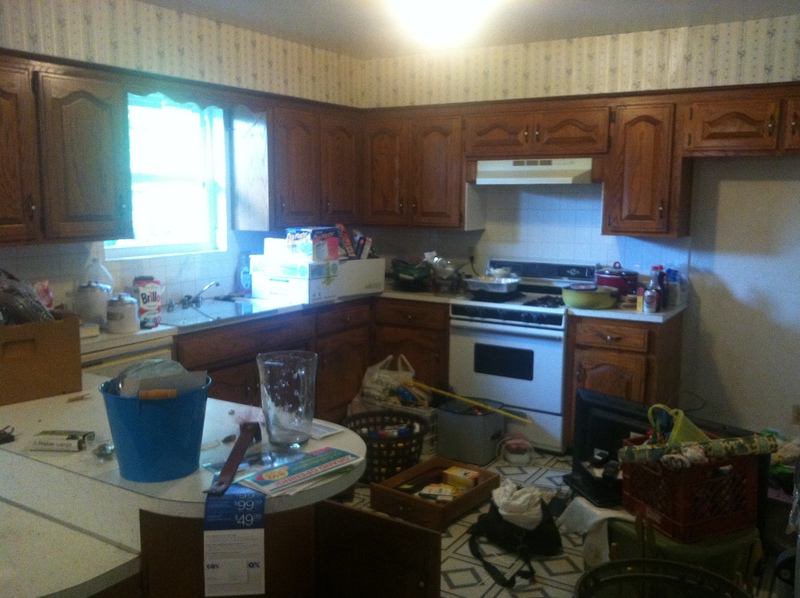 Well, the kitchen, of course but the laundry room and main bathroom are both runners up! What great fun to take a MCM tour this morning. I hit send before I got to say what a hard worker you are. Thank you for sharing!! 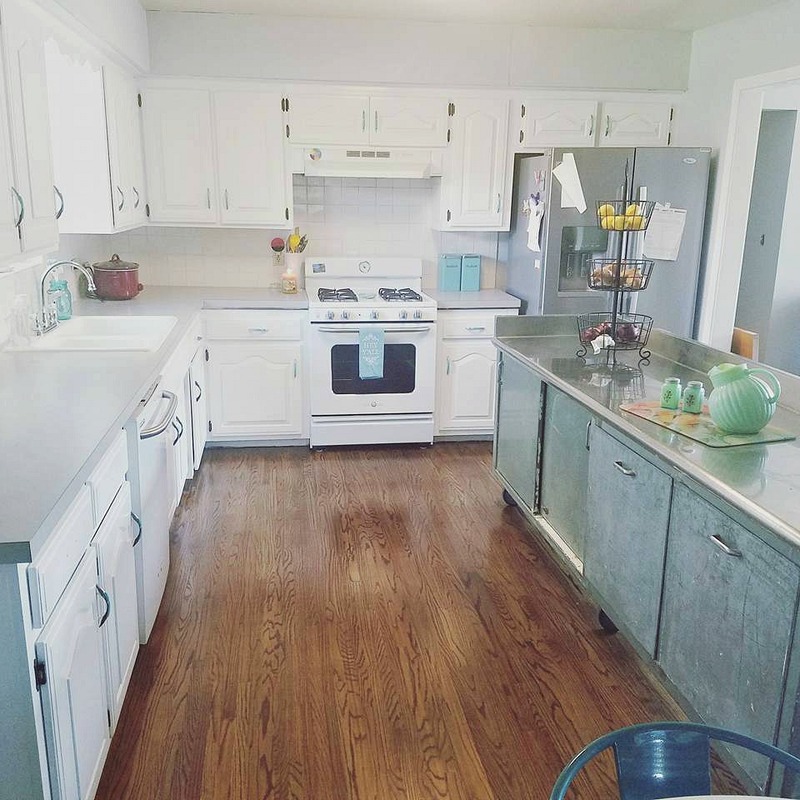 While the kitchen’s updated look has that ‘wow’ factor, I personally liked how you can see and enjoy that ‘wow’ factor after the non-loadbearing wall was removed – the house looks so open and inviting with it gone ! I love the opening up of the living room and kitchen!!! 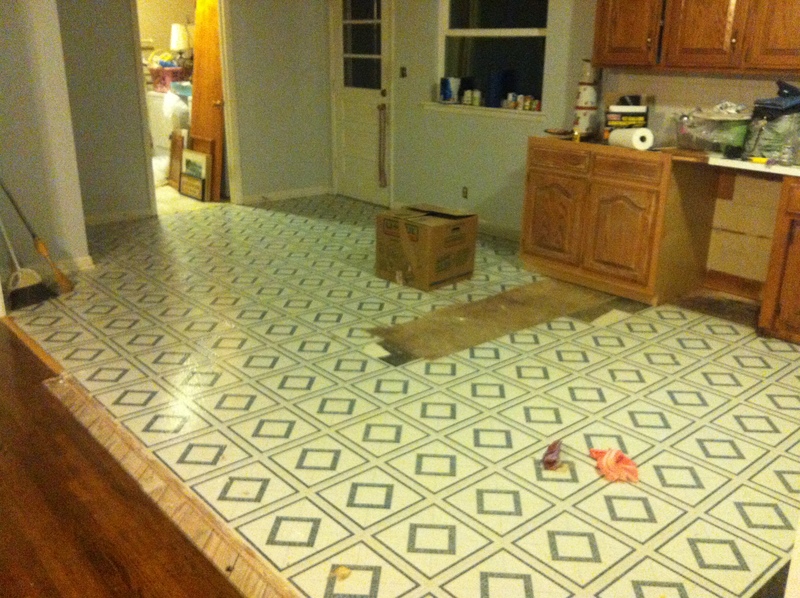 It is so great to watch a young lady do wonderful remodels! You go girl!! I know your Grandmother would also have loved it too. She would have been so proud of you. 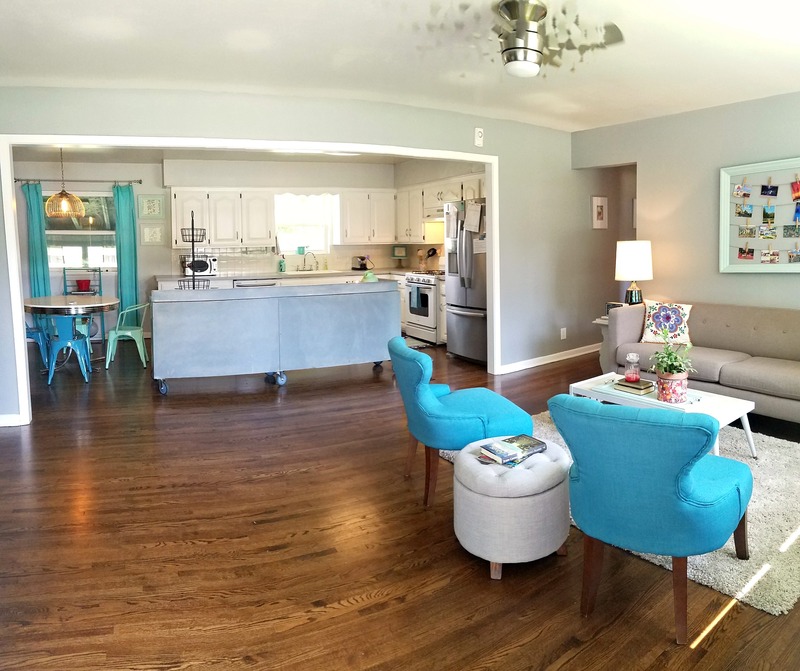 I can relate to you because we redid my parents house. Everything we did I had my Mom in mind. She always wanted to redo a few things so we did it for her only too late for her to see. I think you did a wonderful job on this home and to be honest there is no way I can pick just one thing that is my fav. The transformation is wonderful. Your can do attitude and real estate knowledge are a perfect combination. I enjoyed the process. Your grandparents home reminded me of the home I grew up in. My favorite is the kitchen and the porch. 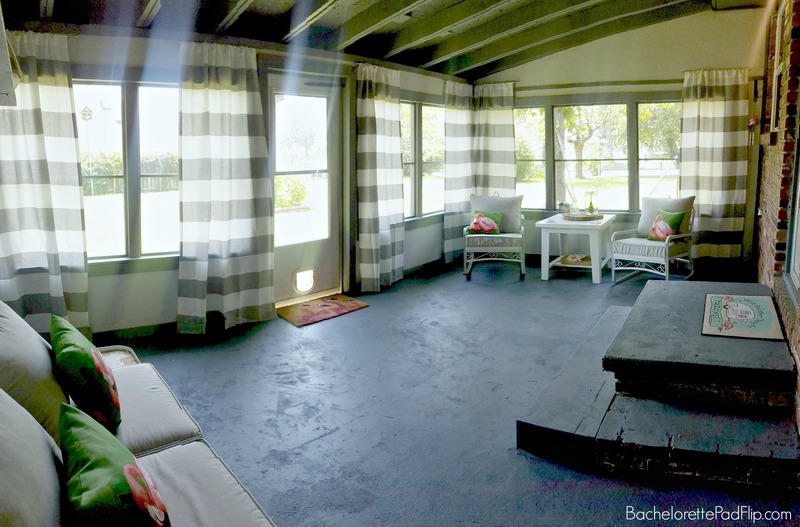 The porch offers extra usable living space as the home, Like the one I lived in, was small. And well the kitchen with its unique island was spot on! Thank you for keeping us informed and showing what one can accomplish. LOVE IT LOVE IT! You do work on a nickel not a dime don’t you! You really picked the color to work with the minty green in the bath-grey. Did you find the hardwood under the laminate in the kitchen?